Beyond brushing and flossing, six-month oral hygiene checkups are essential to any health care regimen. When patients faithfully adhere to this program and maintain good oral hygiene at home, the amount of plaque and tartar buildup is minimal. At these appointments your teeth will be thoroughly cleaned to prevent invasive plaque and bacteria from settling below the gum line. The hygienist will also screen for harmful oral conditions like periodontal disease and oral cancer. She will review your current health status, take your blood pressure and make recommendations to help you maintain healthy teeth and gums. Dr.Bartosh will examine your mouth on an annual basis unless you are having dental problems which require his immediate attention. Protect your smile and your health by visiting us twice a year for a gentle, thorough oral hygiene appointment. New patients will be given a thorough exam including periodontal evaluations so that they may be fully informed as to the health of their gums and supporting bone structure. By means of X-Rays and gentle periodontal probing, all teeth are evaluated and a specific treatment plan is recommended. It is estimated that eighty per cent of the population unknowingly has some form of gum disease. In its early stages patients may have few symptoms and the disease is usually painless. As periodontal disease progresses it leads to bleeding gums, bad breath, deterioration of the supporting bone and eventual loss of teeth. The American Heart Association has determined that periodontal disease can lead to various forms of heart disease. Research also shows that there are connectons between chronic periodontal disease and diabetes, respiratory diseases, increases in strokes and problem pregnancies. With early detection when the only symptoms are swollen, red or bleeding gums, a non-surgical approach can treat and reverse gum disease. Scaling and root planing of all the affected tooth surfaces is accomplished carefully and painlessly, so that gums will heal and return to normal. 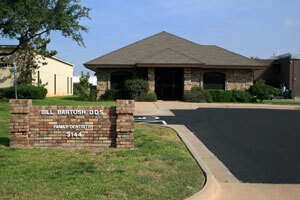 Each patient is given individualized instructions as to the most appropriate means of caring for their teeth at home. Although most patients respond well to the therapy some may experience continued deterioration of the periodontal tissue and may need to be referred to a periodontist for further evaluation. More information on periodontal health can be obtained at the ADA Website. One of the best services we offer our young patients is the application of a pit and fissure sealant to the chewing surfaces of the permanent back teeth. These surfaces are highly susceptible to decay due to the deep crevices that cannot easily be cleaned. It is in these areas that bacteria utilize trapped sugary foods and start the decay process. The sealant acts as a barrier in that it is bonded to the chewing surfaces and fills in the crevices completely. The teeth are easier to clean and clean teeth means no cavities. The process is painless and sealants can last for many years under normal eating habits. I wish sealants were available when we were kids! Drinks have emerged as one of the most significant sources of acid. Drinks such as regular soda, diet soda, sports drinks, canned iced tea and lemonades can lead to extensive tooth decay and enamel destruction because of the low pH or acidity of the drinks. Enamel is the hardest substance in the body but it is susceptible to breakdown from acids found in soda/drinks. The more acidic the drink (the lower its pH), the more rapid the enamel destruction. Tooth enamel dissolves below 5.5. It is important to note that exposed root surfaces de-mineralize twice as fast as that of enamel. Soda/drinks may contain carbonic, phosphoric, malic, citric and tartaric acids and therefore have an acidic pH. Drinks that contain artificial sweeteners still pose a significant threat because of their acidic content. * epidemic that is occurring in children/teenagers today. The best things to drink are WATER, MILK and 100% FRUIT JUICE, with the understanding that even milk and juice have sugar that can lead to decay. Unfortunately, many people today react to stress by grinding their teeth subconsciously, especially when they sleep. The constant pressure generated during this process erodes the chewing surfaces of your teeth causing premature wear. Chronic bruxism can also cause people to have sore, tired jaws and facial pain. Headaches and ear aches are also common. If left untreated, chronic clenching and grinding of your teeth can lead to Tempero-Mandibular Joint Dysfunction (TMJ) which has a long list of symptoms associated with head, neck and facial pain. With thorough examination of your teeth, facial muscles and tempero-mandibular joints, Dr. Bartosh can determine if a bruxism appliance (also called a splint or night guard) is right for you. Let's face it, trauma can occur during contact sports. I have treated many young patients with facial injuries during the course of my practice and in most instances lost and broken teeth could have been prevented. We make custom mouth guards that are comfortable to wear and coordinate with school colors.